1. 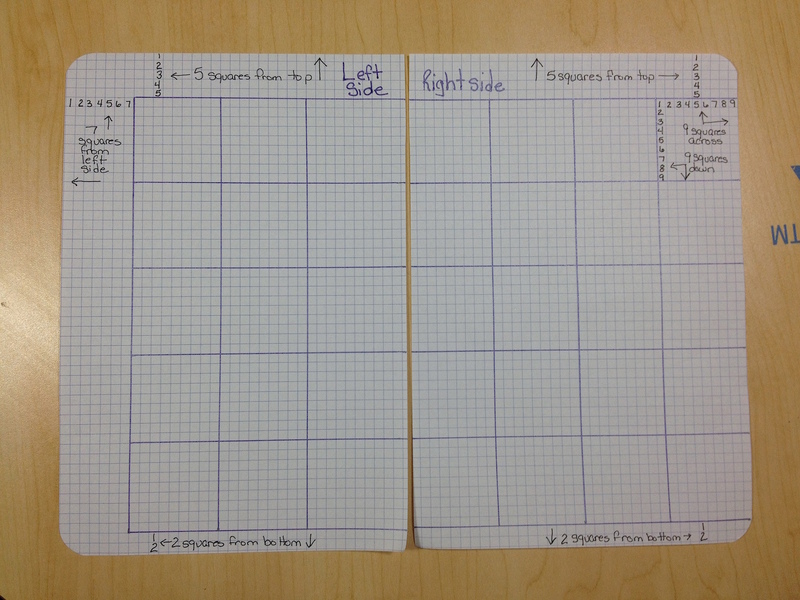 Count 5 squares from the top and draw a line from the far right side to the middle of your journal. 2. Count 9 squares down from that line and make a mark. 3. Count 9 squares down again ( 18 squares so far ) and make a mark. 4. Count 9 more squares down again ( 27 squares so far ) and make a mark. 5. Count 9 more squares down again ( 36 squares so far ) and make a mark. 6. WOO HOO last 9 squares down again ( 45 squares total) and draw a line from the far right side to the middle of your journal. 7. This should leave you 2 squares from the bottom of your page. 8. Now you can go back up to the marks and draw each of them from the far right side to the middle of your journal. You should now have 6 lines going from right to left across your page. 9. Ok lets make the up and down lines. From the top line, starting at the far right side count 9 squares to the left and make a mark. 10. See where this is going? LOL Go another 9 squares to the left and make another mark. 11. Last one! Count 9 more squares to the left and make your last mark. 12. Now go back and draw your lines at the marks from top to bottom between your top line and your bottom line. 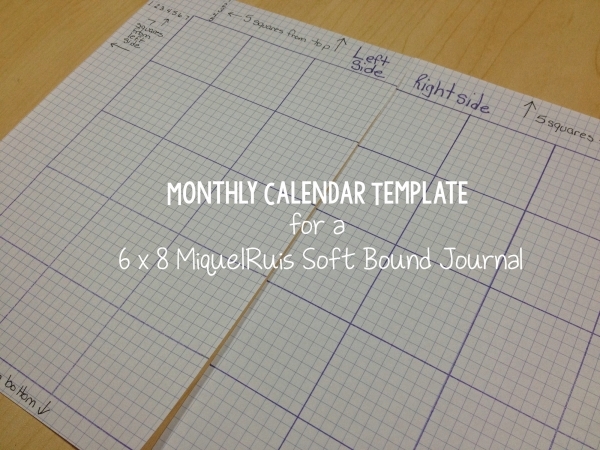 You should now have the basics of your calendar drawn on your right hand side page. Now lets move to the left. No worries lol I wont count this one down for you, well ok maybe a little bit. 1. This side is a bit trickier to get set up but the basics are the same. First count over from the left hand side 7 squares and keep your finger, eye, pen something on that line. 2. Now count down 5 squares from the top and put a mark on the corner where your 7 from the left and the 5 from the top meet. 3. 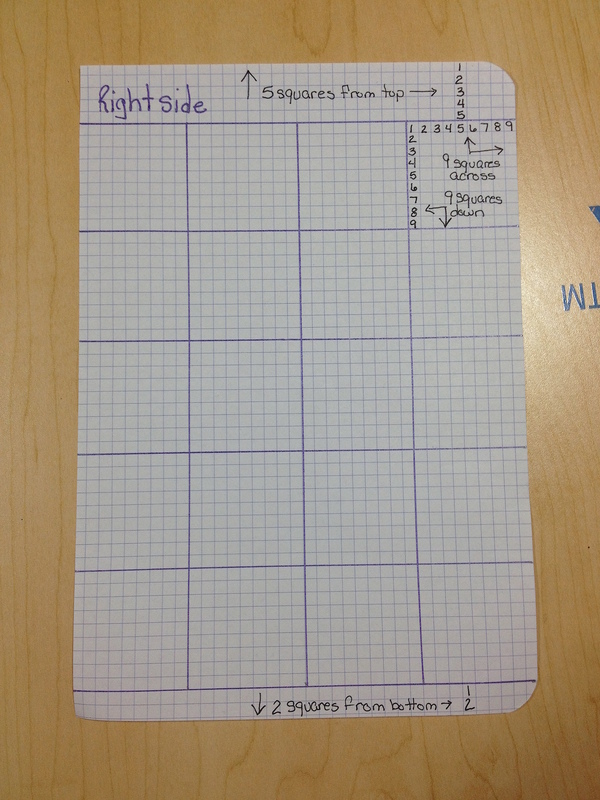 Draw a line from that mark from the left to the right till you reach the center of your journal. Ya top line found! 4. Now go to the bottom of your page count up 2 squares and across 7 squares from the left and do the same thing for your bottom line. 5. Once you have those 2 lines drawn you are pretty much set. Draw from the top lines starting point on the far left down to the bottom lines starting point on the far left. Now you have one BIG box lol Lets break it up a bit. 6. Count from the top line down 9 squares make a mark. 7. Do this 3 more times till you have 4 marks. 9. Do that for all your marks. 10. Now go back up to that top line and do the same thing across. Every 9 squares. You should end up drawing in 2 more lines for a total of 3 boxes across and 5 boxes down. 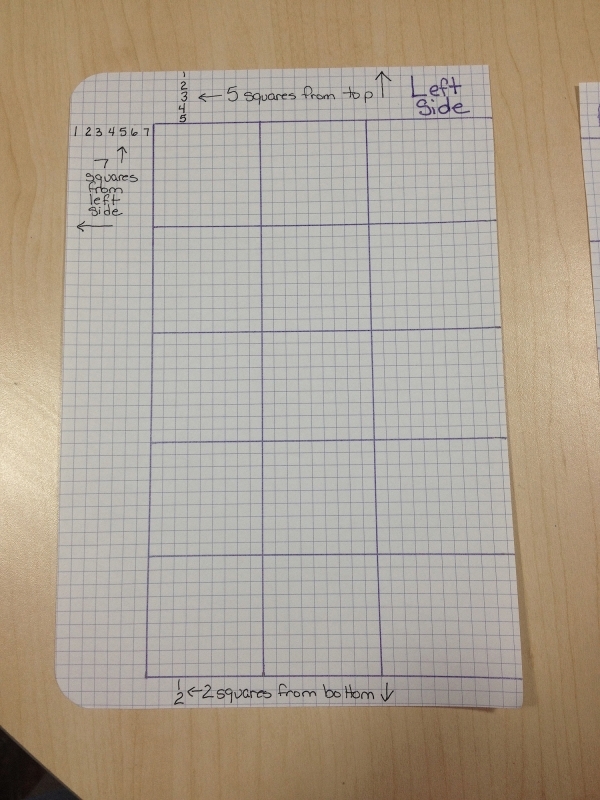 Your 3rd box over ( the one closest to the middle of your journal) will be bigger than the rest because it will allow for the curve of your pages. If you don’t like this just move your 7 boxes from the far left side line over to like 9 boxes if you want. OK so all those words and my guess is you pretty much had it figured out from just seeing the numbers on the photos right? LOL That’s OK. Hope this helped you out. Find me on facebook and show me how your calendar turned out! I would love to see it!